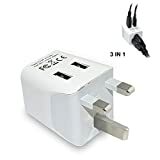 The electrical receptacles used in Ireland are type G. You will therefore need a US to type G adapter in order to plug in your appliances. Special considerations - G Sockets and plugs standard as defined by NSAI I.S. 401 (Plug) I.S. 411 (Socket outlet). Type F ("Side Earth") plugs occasionally seen in old installations probably because much of the early Irish electrical network was heavily influenced by Siemens. " A "shaver" socket (similar to Type C) is sometimes found in bathrooms that will provide low current to some other plug types. 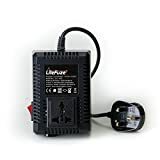 These almost always have a 110 V socket and a 230 V socket in the same unit, or a switch to select voltage, which are sometimes labeled as 115 V and 230 V. The G type socket often has a on-off switch on the socket. 110 V center point earthed transformers are often used for industrial portable tools.